By no means am I a great photographer. Shoot, I’m not even a good photographer. However, certain photos trigger vivid memories for me and this one does just that. It not only reminds me of my overall trip with my wonderful friend, H, whom I met during my year in Munich two-and-a-half years ago, but of so many little and big things that we did during this trip. It was one of the best trips I’ve ever taken and I hope to return the favor to H someday. I know where he lives now, so it’s not like he can avoid that promise 🙂 If you haven’t figured it out yet, the above picture is of the Alps in Southern Bavaria, specially close to the beautiful city of Freilassing, H’s hometown. 04/21: Arrived in Munich. Left my things at H’s (he lives with his grandparents in Daglfing, which is a suburb right outside of Munich). We went grocery shopping for a dinner to take along with us to picnic in a Biergarten that was nearest to our old dorm building. That was a nostalgic shopping trip because the supermarket is completely renovated. I marveled at the modernized store and felt a pang of sadness as I wasn’t there for the renovation. The weather was beautiful as we picnic-ed in the shade as the sun shone. We caught up on each other’s lives and people-watched a bit. Note: I will explain this type of picnic-ing/dinner/general cold meal dealio in a later post. Promise. It’s extremely important to know what it is if you want to understand Bavarian and general German dinner rituals. 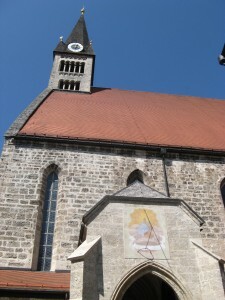 A church in the town of Laufen. 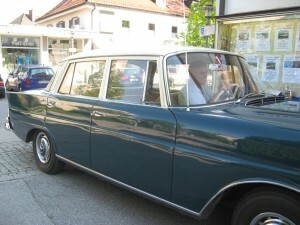 04/22: We headed out to Freilassing and arrived by noon. Unfortunately, there was a lot of traffic on the Autobahn due to the Easter weekend, which meant we had to take the less scenic route to Freilassing. H promised that we’ll most likely be able to take the Autobahn on the way back since the Autobahn route from Munich to Freilassing winds alongside the Alps. During lunch, his parents asked me what I would like to do around their area. Did I want to visit Salzburg? I had already discussed this with Hermann and during one of our brainstorming sessions, he asked me what I thought about riding bikes to Salzburg. It wasn’t too far. Would I be comfortable with that? The look on my face must have tipped him off because he immediately retracted the statement and told me that we obviously didn’t have to. I confessed that I hadn’t really ridden a bike in years, which meant I didn’t count the almost-disastrous bike tour the Munich program took me on in September of my junior year. We nixed that idea and because I had already visited Salzburg 5 times during my stint in Munich, his parents suggested taking a ride in his Dad’s “Old Timer”, in other words: remodeled classic car, to the town, Laufen. They threw out another idea but I was fixated on the idea of seeing a small Bavarian town so I hooked onto that idea. So appealing was the idea that I had tuned out the classic car part. I cannot, for the life of me, remember the make of this vehicle. I believe it’s from the 1960’s. We walked around the small town. The town is directly on the border between Austria and Germany, so we decided to cross over to Austria on one bridge and come back to Bavaria on the other bridge. Later on, H took me on a scenic drive around the area in his sporty BMW. 04/23: H took me to many scenic locations on this day. 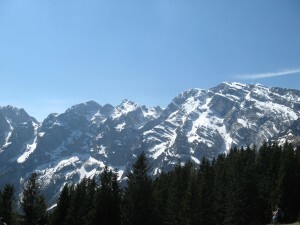 We drove deeper into the Alps and up one section of the beautiful mountain range near Berchtesgaden. It reminded me of the drive up to Mt. Rainier and around the Cascade mountain range in general. Seeing the green valleys and friendly clouds lingering over the mountains took me back to a fond experience I had with my sister and two close friends when we went hiking on Mt. Rainier. 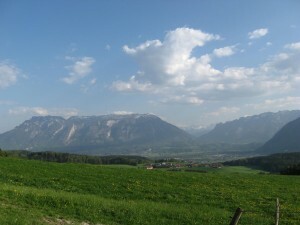 We went to a long stretch of waterfalls by the town of Ramsau and lunched there. We also saw two snakes, one of which was poisonous! (We found this out later when we googled a few of the snake species around the area.) H also drove me to a beautiful lake nestled among the mountains and we walked the entire perimeter of the lake. After lunch back at his parents’ place, we drove back to Munich. 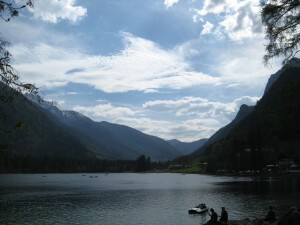 The lake, Hintersee, that H took me to. The day was actually very bright and warm. 04/24: Went to Easter service at H’s very hip and young “church” (it was in movie theater…very cool!). Had lunch with a friend of his and we wandered a neighborhood I was unfamiliar with called “Glockenbachviertel” where all the alternative and hipster-y residents of Munich live. We also sat by the river and peered into a church I had always wanted to look in but never ended up doing so while I was in Munich. We then had dinner and went to a Biergarten to meet up with H’s friend again and I invited a fellow Fulbrighter and good friend, A. I, of course, sipped my liter of beer in complete contentment as we chatted away. 04/25: I went to Schloss Nymphenburg with H. H had to go to his church’s new venue for a performance rehearsal as I continued to wander Nymphenburg with A. At one point, a swan (there are many of them around Nymphenburg) hissed at a dog. Funny, yet frightening. I stopped by the end of H’s rehearsal and marveled at the venue. We had dinner and then returned home. We watched a Bavarian movie that was showing on the Bavarian channel that night on TV called Wer früher stirbt, ist länger tot. I don’t know if they have English subtitles but that movie is absolutely wonderful. It was entirely in one of the many Bavarian dialects, and one of the most moving movies I’ve seen in a while. I just wished I could understand more than 40% of what was being said (H had to translate for me every 15 minutes). 04/26: Had breakfast, talked to H and got ready to leave. Fortunately, I got to briefly meet his grandmother before we headed to the train station. I accidentally greeted her informally, which was stupid of me but I got confused after his parents were so informal with me. I mentally beat myself up for the slip the entire way to the Central Station, although I honestly don’t think his grandmother cared because she continued to be friendly with me (she told me to have a good trip home). Thinking about it now, I probably should’ve split this post into two or maybe even three separate posts. If I have more time later on, I’ll do mini-posts for you all on each of these specific locations with more pictures. This entry was posted in Jill Nguyen '10, Fulbright to Germany and tagged Bayern, Easter Break, Freilassing, Munich, Southern Bavaria, the Alps, Wanderlust. Bookmark the permalink.